Home›Industry news›Cabling Connection›Cabling competence: Are electricians qualified to install underground and aerial cabling? Cabling competence: Are electricians qualified to install underground and aerial cabling? The installation of underground and aerial cable is specialist work. Ian Millner talks to Paul Skelton about how a half-day of training can prevent legal and financial shocks. These days, it’s not possible for electricians to be successful if they don’t have open cabler registration. That’s the thinking of Ian Millner, industry consultant and founder of the training provider Milcom Communications. And he’s not wrong. As the line between electrician and cabler continues to blur, a growing expectation is put on contractors to do everything from electrical work to communications, HVAC and solar. 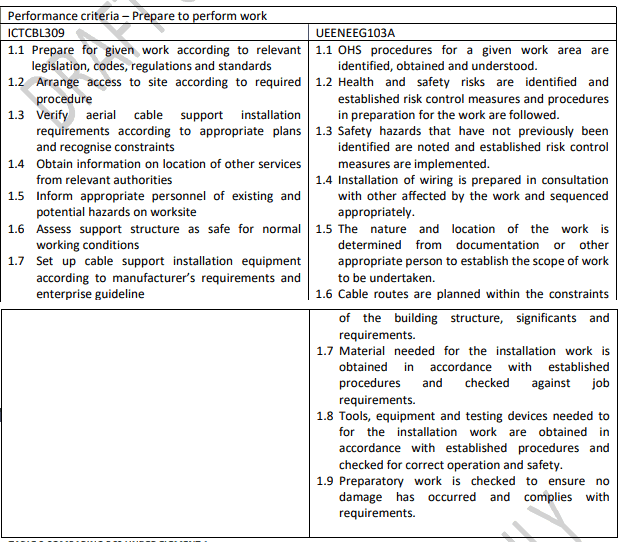 Table 1: Aerial and underground competencies performance criteria. Given this, there is a chance that some electrical contractors aren’t actually licensed to do some of the things they offer to customers – for example, aerial and underground cabling. “An electrician is supposed to have aerial and underground cabling installation among their skills,” Ian says. “This is because service leads, or cabling within premises, can be aerial or underground. “Electricians dig trenches and lay cable, but their training doesn’t exactly go into how they should do it. They are not taught how to install underground pits and pipes, how to ensure aerial cable is adequately supported, or how to take into account things like span, wind velocity and environmental conditions. So, do electricians need additional training to gain specialist competencies under the telecommunications training package? “There are two ways of answering this question,” Ian says. “The first is by comparing the requirements of the aerial and underground competencies in the ICT training package and the training an electrician must complete in the UEE30811 qualification. “The second is by looking at what the electrical regulator deems the ‘essential performance capability requirements for licensed electricians’. “Regardless of which way you look at it, it can be suggested that a qualified electrician who has completed a competency-based training course to gain open cabler registration does not meet the requirements for automatically being awarded the aerial and underground competencies. Table 2: UEENEEG103A performance criteria. That said, Ian believes the solution could be as simple as a half-day course that is offered by most registered training organisations. “According to the ACMA’s Cabling Provider Rules, any cabling on the customer side of the network boundary must be installed by a registered cabler. Specifically, Ian points to differences between the UEENEEF112A/113A competencies in the UEE30811 training package and the ICTCBL307/308/309/310 competencies to highlight an electrician’s need for further training. Table 1 shows the performance criteria (PC) for each of the ICT competencies. Table 2 shows the PC for the UEE30811 qualification. “As you can see, the UEE description is significantly shorter,” Ian says. • comply with any and all necessary regulations (AS/CA S009 and AS/NSZ3000, for example). “And, by drilling down into UEENEEG103A and looking at the ‘required skills and knowledge’, the unit specifies ‘T5 aerial cabling’ and ‘T6 underground cabling’. “So at face value it seems that an electrician could be awarded the aerial and underground specialist competencies. Table 3: Expanded performance criteria for comparison. By mapping an electrician’s training to the work required for aerial and underground cabling, it can be concluded that someone holding the electrical qualification for UEE30811 who has gained open cabler registration does not meet the requirements for the specialist competency under the Cabling Provider Rules. “If an electrician with an open cabler registration enters someone’s premises and runs a communications cable out to a granny flat without having the right endorsement, they are violating their registration conditions as well as the Telecommunications Act,” Ian says. As the rollout of the NBN progresses, albeit slowly, around the nation, the number of electricians being asked to run aerial and underground cabling has and will continue to increase.